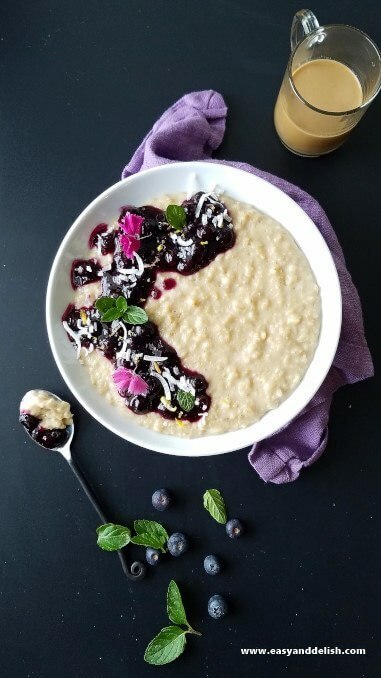 Blueberry Coconut Oatmeal Pudding is a quick, easy, and creamy fiber-loaded dessert that will become your next non-guilty pleasure. It’s both dairy-and-gluten-free! Oatmeal for breakfast? 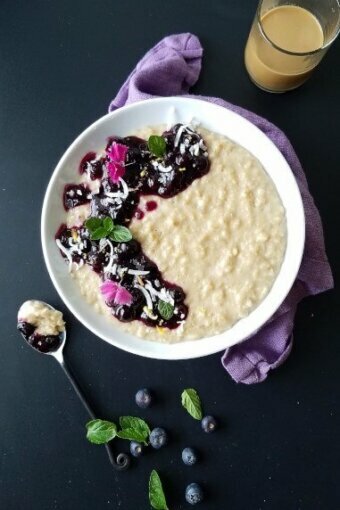 How about Blueberry Coconut Oatmeal Pudding for dessert? I am tellin’ ya, it’ll become your ultimate favorite treat… Check it out! It can be made ahead and refrigerated to enjoy the next day. I enjoyed mine in the afternoon with a cup of dairy-free latte! So good! If you feel like having dessert for breakfast, don’t be shy! It is a great way to start the day with a big smile on your face. If you are in a rush, place the pudding and sauce in a mason jar and eat it while driving to work. First prepare the sauce. Combine water, sugar, cornstarch, and lemon juice in a saucepan, whisking well until obtaining a homogeneous mixture. 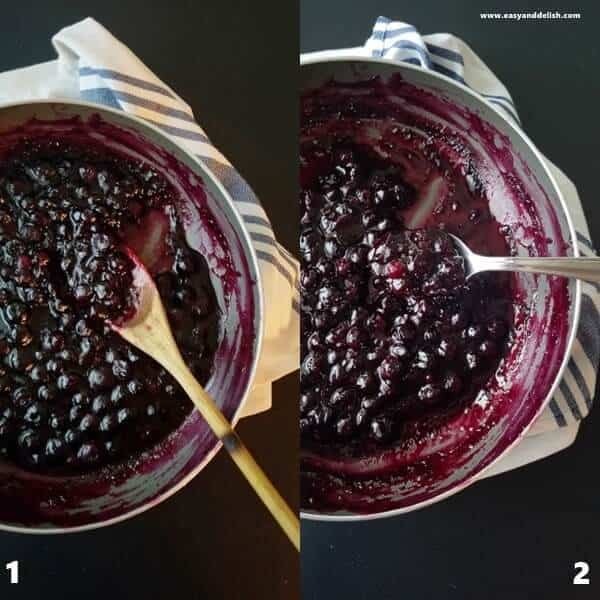 Add frozen blueberries and let simmer over medium-low heat, stirring carefully with a wooden spoon until sauce thickens, about 4-7 minutes. Stir in a bit more lemon juice and remove from heat. Next, prepare the oatmeal pudding. In a saucepan, combine oats, water, and salt. Bring to a boil over high heat. Reduce heat to medium-low and stir constantly with a pointed wooden spoon or the handle end of a wooden spoon. Let simmer, while stirring, until cooked (about 5-10 minutes). Remove from heat and stir in coconut extract, coconut milk, sweetener, and coconut flakes. Spoon into small bowls or ramekins, top with the blueberry lemon sauce, and garnish with coconut flakes. Enjoy either warm or chilled! See? Easy peasy! It is an explosion of flavor! Something new to make with oatmeal. Blueberry Coconut Oatmeal Pudding is a quick. easy, and creamy fiber-loaded dessert that will become your next non-guilty pleasure. It's both dairy-and-gluten-free! First prepare the sauce. Combine water, sugar, cornstarch, and 1 Tablespoon of lemon juice in a saucepan, whisking well until obtaining a homogeneous mixture. Next, prepare the oatmeal pudding. In a saucepan, combine oats, water, and salt. Bring to a boil over high heat. Reduce heat to medium-low and stir constantly with a pointed wooden spoon or the handle end of a wooden spoon. Let simmer, while stirring, until cooked (about 5-10 minutes). Remove from heat and stir in coconut extract, coconut milk, sweetener,and coconut flakes. Spoon into a small bowl or ramekin, top with the blueberry lemon sauce, and garnish with coconut flakes. Enjoy either warm or chilled! Add frozen blueberries and let simmer over medium-low heat, stirring carefully with a wooden spoon until sauce thickens, about 4-7 minutes. Stir in 1/2 to 1 Tablespoon of lemon juice and remove from heat. Next, prepare the oatmeal pudding. In a saucepan, combine oats, water, and salt. Bring to a boil over high heat. 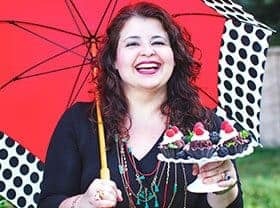 Spoon into a small bowl or ramekin, top with the blueberry lemon sauce, and garnish with coconut flakes. Enjoy either warm or chilled! Let simmer, while stirring, until cooked (about 5-10 minutes). Remove from heat and stir in coconut extract, coconut milk, sugar, and 3 Tablespoons of coconut flakes. 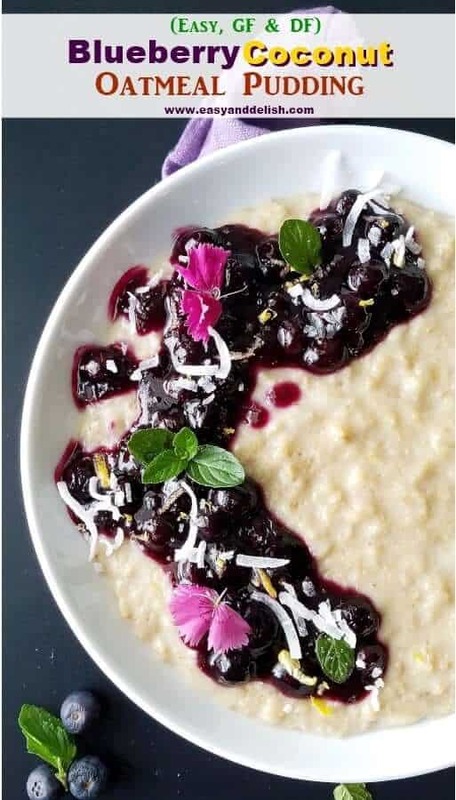 Spoon oatmeal pudding into small bowls or ramekins, top with the blueberry lemon sauce, and garnish with the remaining coconut flakes. Enjoy either warm or chilled! Lemon rind and mint leaves can also be used as garnishing for the sauce as well. In this case, only add them right before serving to avoid drying out. Any oatmeal pudding and sauce leftovers should be stored covered in the refrigerator. 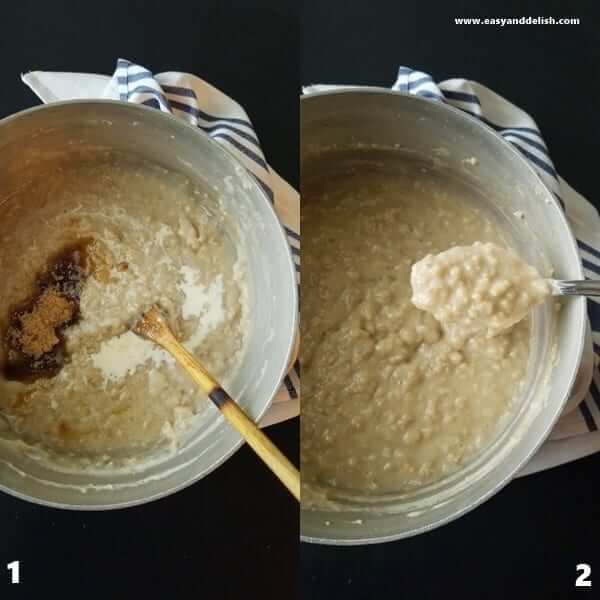 Take a look at our 4 TIPS ON HOW TO MAKE THE PERFECT OATMEAL for your next breakfast! Thank you so much Anika! I have tried to visit your blog several times without success. Your homepage is not loading. Blueberries and lemon are such a fabulous combination. I’m wondering if this lush pudding is just another excuse to have oatmeal for breakfast! Golly! This looks like it’s loaded with flavor. Love the way it looks, too — so pretty. Good stuff — thanks.